Time Walker is the fifth full length studio album for this Swiss quintet. As has been the case since their debut in 1998, Crystal Ball stays true to their melodic hard rock meets melodic power metal sound. For those of you who haven't listened to this band before, I would classify Crystal Ball's sound as in the same realm of Axxis or PC69. In other words, they blur the line between European hard rock and power metal. There's nothing original or unexpected to be found on this album, but there's no doubt that the guys have put forth a first class effort with this album. Thus, fans seeking originality can skip to another review, yet fans of this genre will undoubtedly find a lot to like here. For me, Time Walker is s step up form their past two releases, Virtual Empire and Hellvetia. This album sees the quality level of the songs go up, and the guys maintain that quality level for the duration of the album. Before you know it, 44 minutes have quickly passed and the album is over. Each of the eleven songs presented on this album is well crafted, and very memorable. As I mentioned before, there is nothing original here. In addition, the instrumentation is not very technical or complex. Sure there are numerous solos and quality riffs throughout the album, and I could comment on them individually. However, if you think about it, and rock/metal band can come up with some well done riffs and solos. 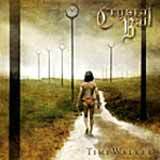 In fact, Crystal Ball is a band that is overflowing with quality musicianship all the way around. As we all know, that is not enough to make a great album. Having said all that, this album has practically insisted on repeat spins from me for the past couple weeks. Why is that? The songs are just good, old fashioned, no frills melodic rock/metal. A band can have all the technical talent in the world, but suffer an inability to write a memorable song. Simply put, Crystal Ball is very good at what they do. Each of the songs is full of melody, catchy chorus lines, and a crystal clear sound. While there are no surprises in store for the listener, there is no denying the fact that each song is very well performed and they make for an enjoyable listen. The one drawback of this band that I imagine people would point out is the lead vocals. His voice does sound a bit thin and lacking of power. Also, his style isn't nearly as charismatic as someone like Shakra's lead vocalist, but he at least does a decent job with what he has. With strong song writing and extensive use of harmony vocals, the band is able to play down the shortcomings of Mark Sweeney's voice. Aside from this minor complaint, the band delivers a nice slab of what melodic rock/metal should sound like, with a focus on writing quality songs. One trait of a quality album for me is the ability to listen to the album straight through without skipping any tracks. Time Walker falls under that category. Fans if melodic hard rock and metal should find a lot to like here. Sure, I like exciting new bands just as much as everyone else, but when a band can perform a well established sound at a top notch level, I am all ears. Ever since about the late 1990's, there has been a resurgence of bands playing this genre. There have been many enjoyable bands to emerge from this, but certainly not all of them. In my music collection are several albums that I have listened to just enough times to write a review, only to let the album collect dust on my cd rack afterwards. That's not necessarily indicative of the band's musical skills. Writing quality songs and doing so for an entire album is what keeps me coming back to an album. Time Walker is certainly an album well stocked with quality melodic rock/metal that will keep you coming back for more. The modest shortcomings of the lead vocalist may hinder this band from reaching the top of their genre, but the quality of the songs, and the musical performances are strong enough for me to recommend this album to fans of the genre in general. I foresee this album fighting for a spot in my "best of" list of 2005.